As mentioned in the previous article in this series, beneficial partnerships are the way of nature. 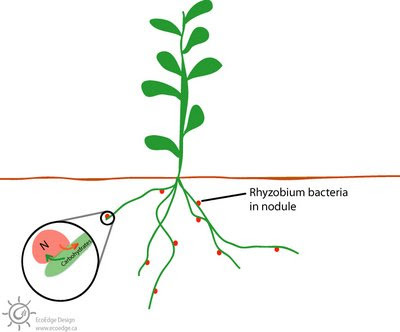 In particular, some microbes (Frankia and Rhizobium) form associations with certain plants allowing them to fix atmospheric nitrogen into a form that plants can use. These symbiotic partners can help us to rehabilitate damaged landscapes, preparing the soil for a succession of more long-term plants. This piece focuses on woody plants that associate with the bacteria of the genus Rhizobium. We can see from the diagram below that there are 3 subfamilies of the family Fabaceae (AKA Leguminosae). These families are Faboideae (AKA Papilionoideae), Mimosoideae, and Caesalpinoideae. Note that not all the trees in these subfamilies are nitrogen-fixers. Among the Caesalpinioideae, 23% are nitrogen fixers. For Mimosoideae, the figure is 90%, and for Faboideae, 97% are nitrogen-fixers. 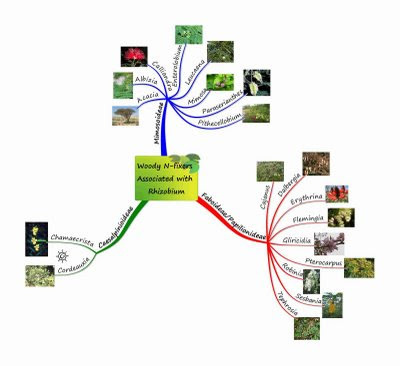 As the diagram shows, Mimosoideae contains the nitrogen-fixers Acacia, Albizia, Calliandra, Enterolobium, Leucaena, Mimosa, Paraserianthes, and Pithecellobium. Caesalpinoideae‘s nitrogen-fixers are Chamaecrista, Cordeauxia; and Faboideae has Cajanus, Dalbergia, Erythrina, Flemingia, Gliricidia, Pterocarpus, Robinia, Sesbania, and Tephrosia. To rapidly revegetate a damaged landscape, be sure to include plenty of these species to help quickly build up the soils. In areas of very problematic soil, such as arid, tropical and subtropical regions, make 90% of your initial planting of trees nitrogen fixing, pioneer species (associating with either Frankia or Rhizobium), and 10% of species your long-term canopy overstory species. When the system reaches maturity, the proportions will be reversed with 10% nitrogen-fixing, support species and 90% canopy species. The same formula could be followed for humid temperate regions, but the soils in these area are not so fragile and can stand a lower percentage of nitrogen fixers. A 70/30 or even lower may suffice in these areas, as the seasonal cycles of death and regrowth feed these soils well. 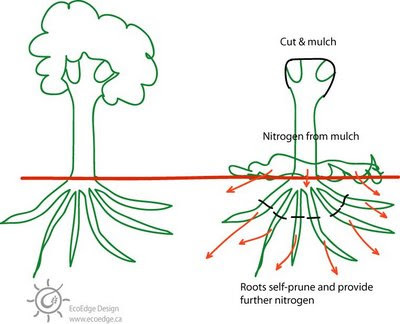 As the diagram below shows, the nitrogen-fixing support trees can be pruned (coppiced, pollarded, shredded or sacrificed) to provide mulch, fodder, fuel or fibre. As this is done, the roots of the tree self-prune, releasing nitrogen into the soil. The highest concentrations of nitrogen are to be found in descending order in the seeds, the seed pods, the flowers, the leaves and then the woody parts of the tree. 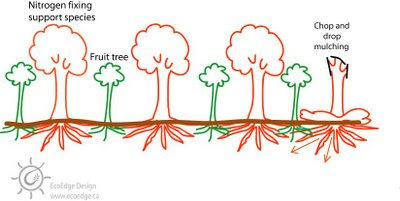 Inter-planting with fruit or nut trees naturally provides more soil nitrogen. But interplanting also makes the job of chop-and-drop mulching that much easier.